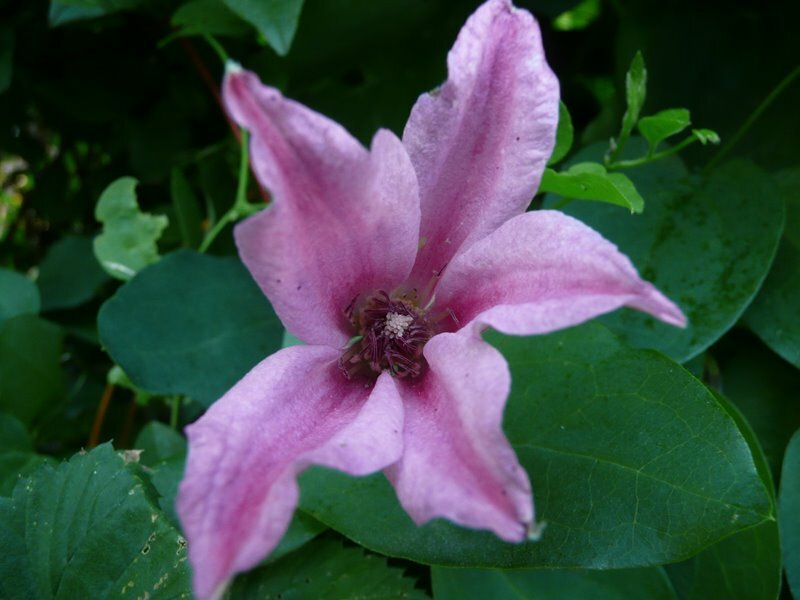 Our Life in Montana: "Once a clematis creeps into your heart, there's no letting go." 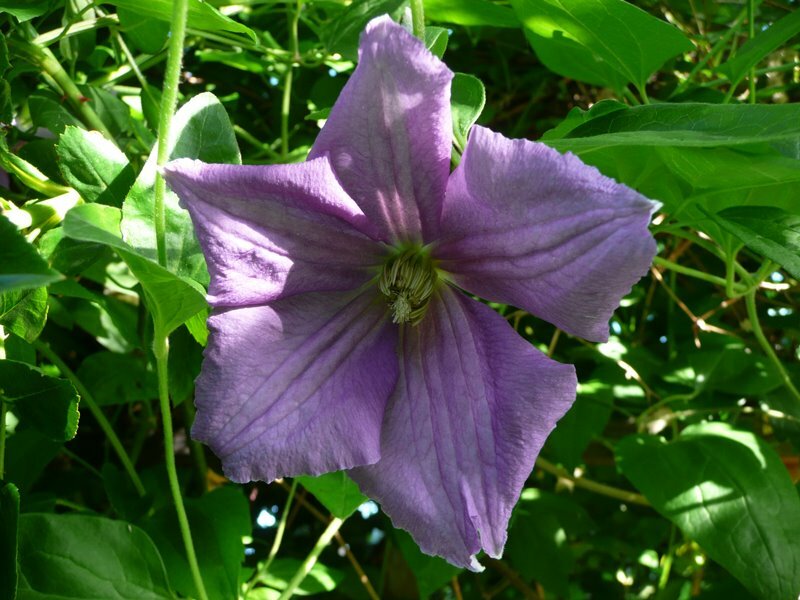 "Once a clematis creeps into your heart, there's no letting go." The title quote is from The Cultivated Gardener by Anne Raver. I realize we love clematis. We must, we have so many of them! Let's start with Comtesse de Bouchard. It grows in our Moongarden. "Large semi-double rose-pink flowers with yellow stamens. June-September. Grows to 12 feet." Also in the Moongarden is Perle D'Azur. 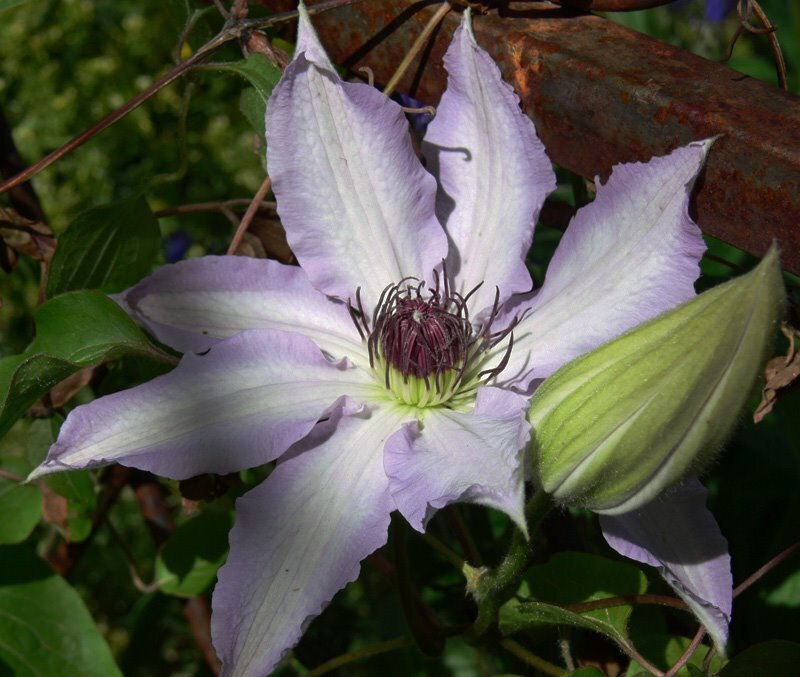 "One of the finest sky-blue clematis flowers available. 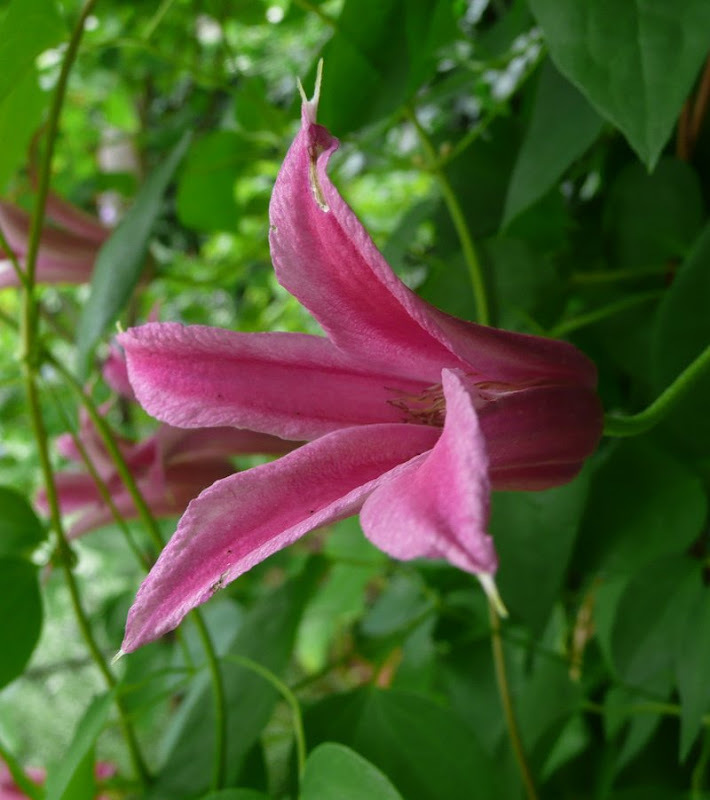 Large, 4-inch single flowers cover this hardy vine continuously through September." Well I wouldn't call it "sky-blue". More like "purple". Lilac, maybe. Going absolutely crazy in the Moongarden is the Duchess of Albany clematis. "Bloom time: July to September. Flower size: 1.5" (4cm). 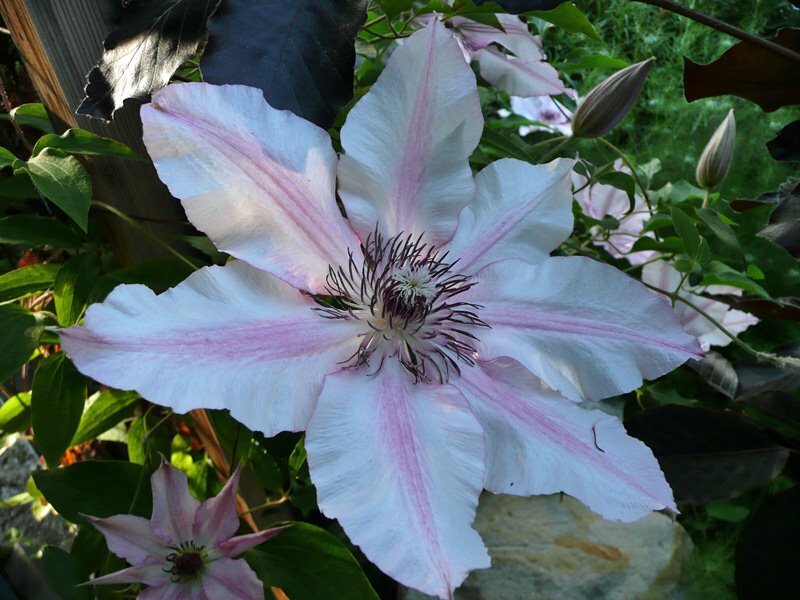 Height: 8-12 feet (2.5-3.5m)" Very similar to the Princess Diana clematis. 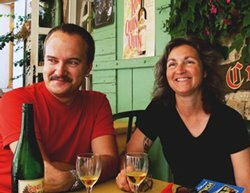 Also in the Moongarden are Henryii and Halina Noll. We've not seen a bloom from either for a while. 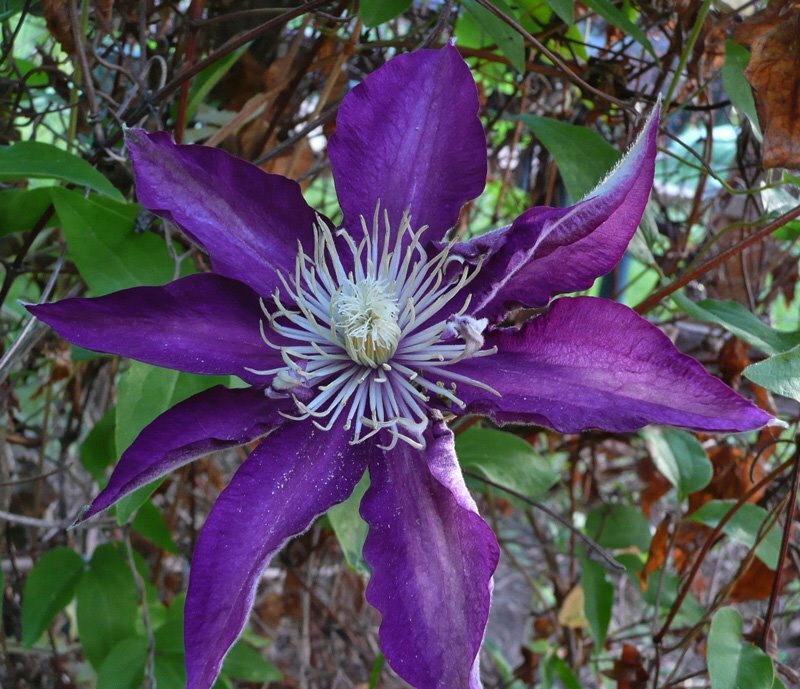 Perhaps eight years is too old for a clematis? They were planted at the Moongarden's inception and are both a stunning white. The Fargesioides (Paul Farges, Summer Snow) more than makes up for them. "This is a vigorous plant suitable for growing through a large shrub (even a conifer) or on a wall. The pure white 2" flowers are borne in axillary clusters. Stamens are prominent and make the flower most attractive. If pruned hard in spring, flowering will begin in July, or in June if left unpruned. This is one tough plant, tolerant of harsh conditions. Good groundcover for difficult terrains. Flowering Months: June-Sept. Height in Feet: 10' - 20'" Yes, it is one huge vine. More of a weed as it loves to reseed. Everywhere. We planted it for quick cover. It's been that. But look how pretty it can be. We have Poulvo planted at the foot of a trellis located in one of the garden beds. Still waiting for it to bloom. It's only been there a year or two, so no worries. 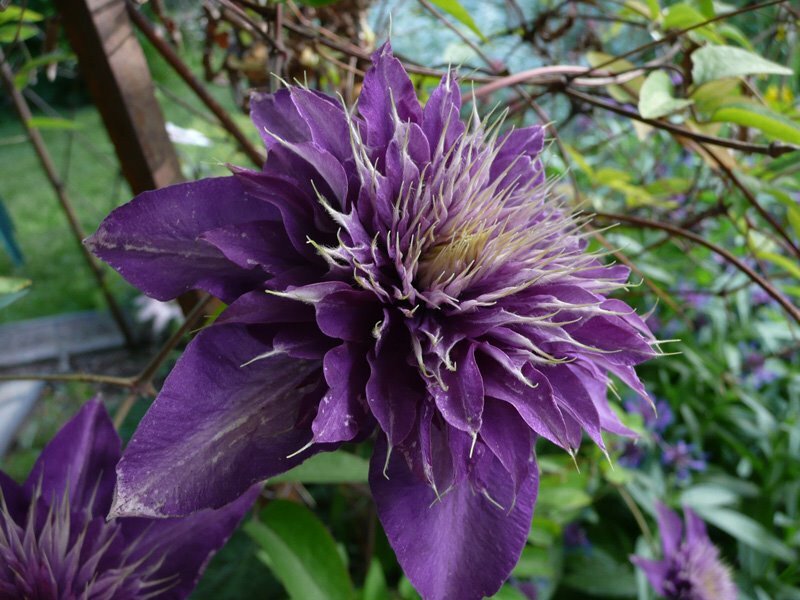 I give our clematis plenty of leeway when it comes to performance. "Early Large-flowered Group (1970 Poulsens Nursery) - Bright red with creamy yellow stamens. Flowers late spring to early summer and late summer. Should look like this when it finally blooms. 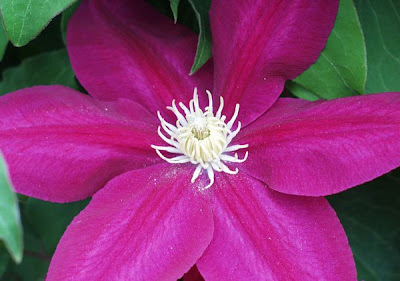 Fireworks clematis is planted on a trellis on the pump shed next to the pond. "Prolific 'Fireworks' is an early variety with dramatic, 6–8in mauve-purple flowers. Each petal is intriguingly twisted and streaked through with a reddish purple flash. It’s impressive on a pergola or arch, and expect a second, smaller bloom on new growth in late summer." It starts out with mauve-purple flowers and they fade to off pink. Nice in all stages. where we have Haku Ookan. "Bloom time: double in May and June. Single in September. Height: 8-12 foot." 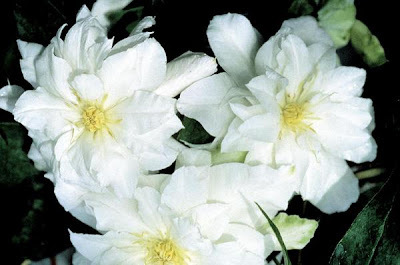 "Creamy white overlapping petals with purple-like boss of anthers. Blooms June-August. Height: 5-8 feet." Another newish clematis to our garden is Montana 'Mayleen', opposite Florida Sieboldii on the clematis arbor. "Small satin pink open flowers. Bronze foliage with strongly scented flowers. Blooms May and June. Grows 20-30 feet." Hasn't bloomed as of yet. 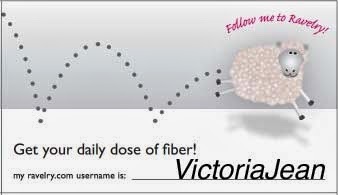 Should resemble this when it does. On the metal gazebo we have Blue Moon. "Light blue flowers, strong grower. May-September. 8-12 feet." Princess Diana pulls its weight on the metal gazebo: "Elegant, long tulip-shaped flowers of luminous pink with a slightly darker pink bar. Flowers midsummer to early autumn. Height: 6-8 feet." Multi-Blue is also a reliable bloomer on the metal gazebo. "Very double dark blue to purple, 4-5 inch flowers. June, July and September. Grows 7-8 feet." On the fourth corner of the metal gazebo Arctic Queen used to grow. And last we have Niobe which has been growing in a pot in the front garden for years now. 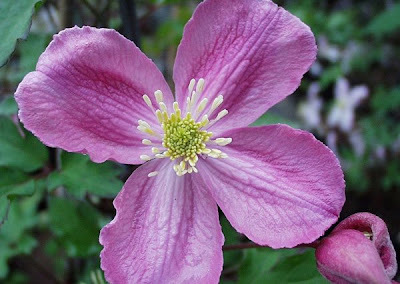 "For its hardy, manageable habit and its quantities of large, opulent long blooming flowers amid green tapered deciduous leaves, this celebrated Clematis earned the coveted RHS award in 1993 and worldwide notoriety. Single and flat-faced, nearly 6 in. wide blooms showcase 6 to 8 rich as velvet, ruby-red tepals, which are broad at the base, narrowing toward the tip and clutched in the center by sprightly yellow stamens, while aging to the color of a fine red wine. Blooms June–September. Size: 6'–7-3/4' high - hardy to zone 4." Niobe has been a great, reliable bloomer for us. 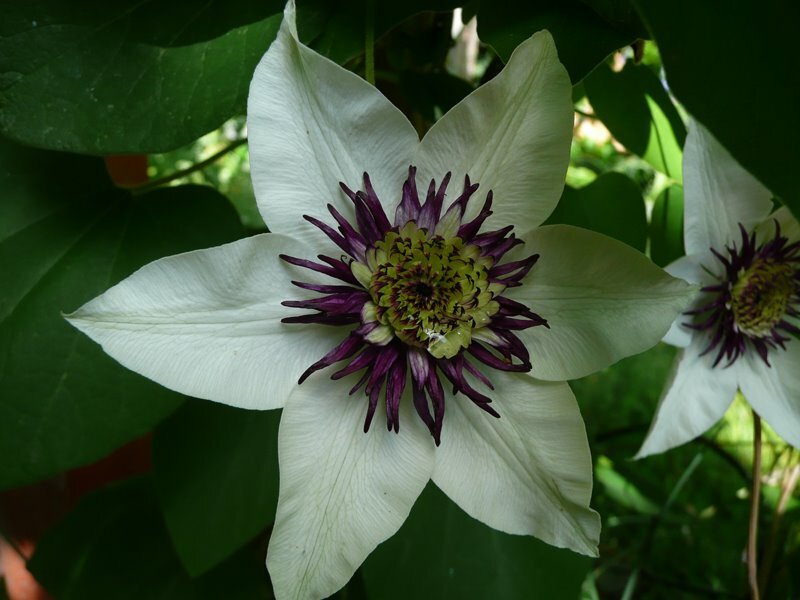 We "experimented" with (killed) clematis plants a while before we were able to achieve "lift off" and get them to actually live, grow and flower. 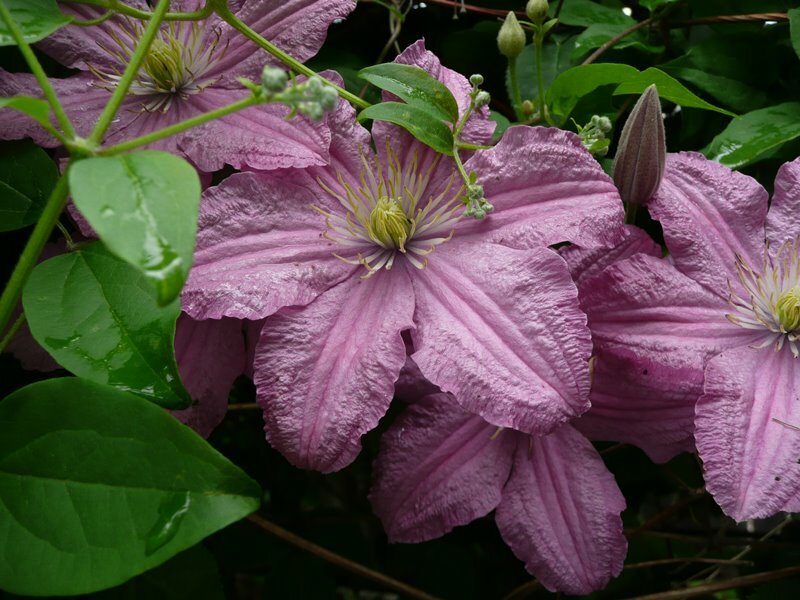 A great site with lots of clematis info: Home of Clematis. "To prune or not to prune," is the most often asked question. It should be noted that incorrect pruning will never bring an early death to the clematis. At worst an inappropriate pruning will only delay flowering. Furthermore, if all varieties were left unpruned they would all flower very well. However, as is explained below, the flowers would not necessarily cover the plant as well as they otherwise could." 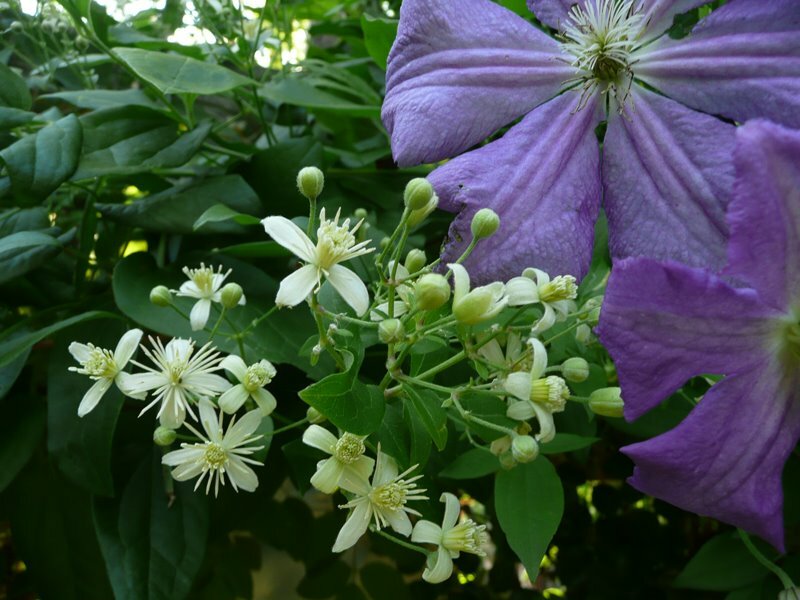 And then they continue on to explain pruning all groups of clematis; A, B and C.
I just love Florida Sieboldii, and Multi-Blue! Diana's pretty too. I've never had those before, and it sounds great that they flower into the fall. All of mine, save one variety, are finished blooming. I wasn't good about keeping tags when I planted my clematis (several yrs. ago) so now I couldn't tell you what kind I have! I'm wondering if yours flower longer because your climate stays cooler than ours here in VA? Otherwise, I'd love to add some new ones! What a glorious collection of Clematis!!! It is hard to find a favorite. Wow!!! Niobe is said to bloom for a long period and sounds like it is living up to its claim. Love the dark stamen on the Fireworks. 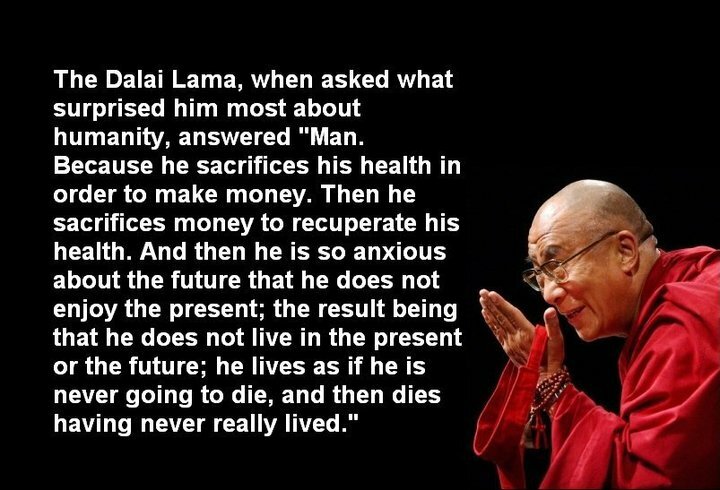 Well I definitely agree with that statement! You have some beautiful ones, I don't think I have any of the same except for 'Henryi' which I just planted this year. I'm keeping an eye out for 'Florida Sieboldii'! totally gorgeous. I don't have any clematis. Buts its definately on my list of things to start. The Florida Sieboldii is beyond gorgeous! Thanks for posting all the names of your blooms! Beautiful! I tried a couple of them a few years ago, but they never grew. They start each spring just to die within a couple weeks. I couldn't agree with you more ~ I love clematis too although I seem to be killing mine off this year by overwatering. 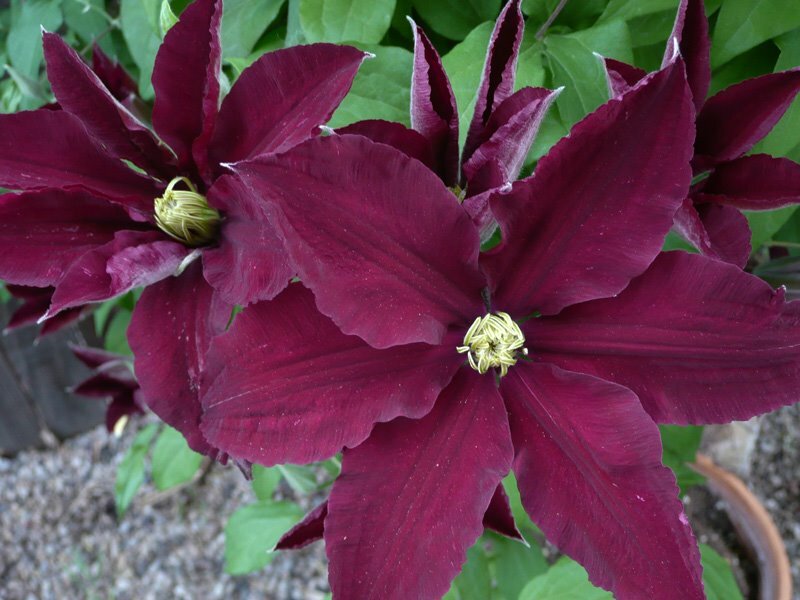 Your 'Princess Diana' clematis has a similar shape as my favorite ~ 'Texensis' ~ I love the bell forms. You have a fabulous collection. I think they are all gorgeous. I only have one that you have (Multi Blue) and I just purchased her this year too. Gorgeous clematis! I love them too. In fact, I just planted one in my back yard to wrap around a standing bird house I have there. I'm keeping my fingers crossed that it will flourish! So gorgeous! When I brought home my most recent clem (Ragoochi), Jordan said, "Don't you have enough clems now?" He obviously doesn't understand...you can never have too many! You have so many pretty clematis! I have several, but would like to add a few more. They sometimes take a few years to really take off, but it's worth the wait.